Er zijn momenteel 19503 spelers online! Mens tegen machine - succes! Stem op de beste zet om te winnen! Backgammon, Yatzy, en nog veel meer! Leer van topschakers en profs! Test je vaardigheden tegen de computer! Kun jij hem elke dag oplossen? Maak vrienden en speel teamwedstrijden! Vind lokale clubs & evenementen! Wie van je vrienden is de beste? pChess is now available on the iPad!! pChess for OS X — comes with both a stand-alone OS X application, and a UCI Engine. pChess is a basic chess programme for Macintosh OS X, with nice graphics and a built-in FEN Viewer. It supports Fischer games, copy/paste of FEN positions, SAN Notation, Load and Save, and unlimited Undo/Redo. Cool Audio and Visual Brain features let you listen and see as it evaluates moves. The opening book includes over 10,000 moves from the ECO (Encyclopedia of Chess Openings). Runs at about 1500 ELO. Comes complete with FutureBasic 5 source code. • Speed Optimization: 30% FASTER than pChess 1.9.2. • PGN File Support: You can now load and save standard (single game) .pgn files. • Fischer Castling: Castle in a Fischer game by capturing your Rook with your King. 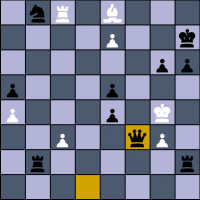 • UCI Engine now supports the 'UCI_Chess960' option, and plays Fischer games. causing the engine to stall in cutechess. interfaces to not register a queen promotion, when in fact there was one. • Fancy schmancy new icon.